Great bosses have strong relationships with their employees. Kim Scott identifies three simple principles for building better relationships with employees: make it personal, get (sh)it done, and understand why it matters. The Radical Candor method is about providing guidance with a mix of praise and criticism to produce better results and help employees achieve. How to build radically candid relationships with your team members. How to get, give and encourage guidance. Techniques for avoiding boredom and burnout on your team. 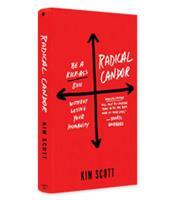 Why radically candid relationships will help you get the results you want.